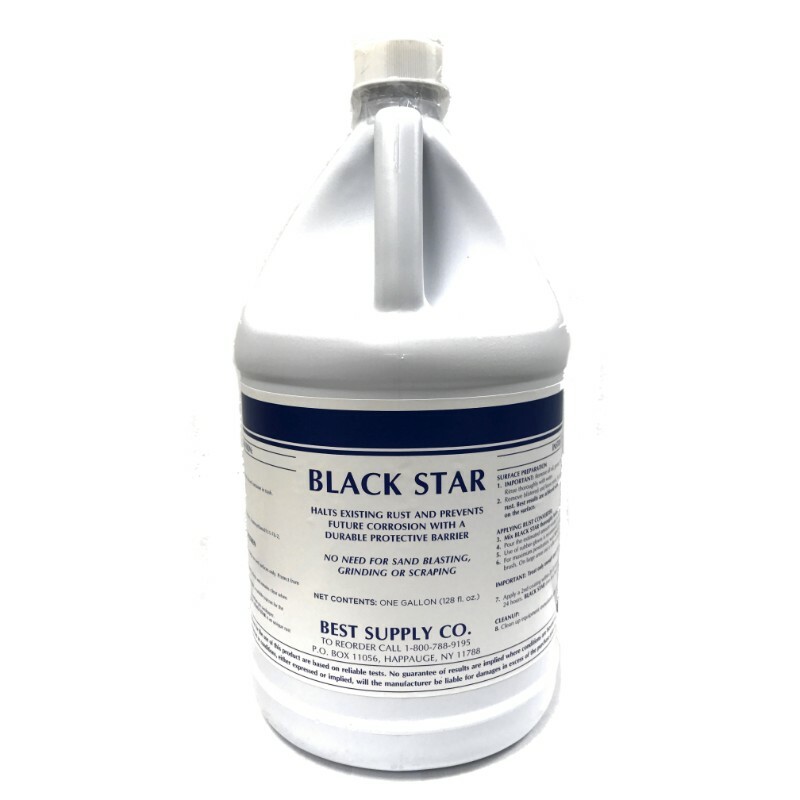 Below you will find only the best helpful answers to your rust questions and problems that have come from thousands of Black Star Rust Converter Customers. When iron or steel is exposed to air in the presence of water or moisture, the well known rusting process takes place. The metal is degraded to form ferric rust, a red-brown compound, which is a sure sign of electro chemical oxidation of the underlying metal. What is a Rust Converter? A: A Rust Converter is a synthetic polymeric formula that converts rust on metal into a water free, protective black surface. Not only does it convert and kill existing rust, but it seals out water to prevent future rust formation and further degrading the underlining metal. Metal surfaces protected with this premium conversion process resist the effects of weathering, sunlight, rain, and salt water without degrading, peeling, or cracking as long as the rust converter is maintained per manufacturer's recommendations. Rust Converter gives is a perfect base primer for oil base and epoxy paints. This fast and easy application of rust converter is all you need for permanent rust prevention on your steel or iron surfaces. Q: Does a Rust Converter have a shelf life? A: Yes. Rust Converter (opened or un-opened containers) must be used within 2 years from the date of purchase if it is stored properly according to the manufacturer's recommendations. Q: What is the coverage area for one gallon of Rust Converter? A: One gallon of Rust Converter will cover approximately 400-500 square feet of a slick, smooth, non-porous surface. Irregular, porous or textured surfaces may require more rust converter. Q: What objects can a Rust Converter be used on? A: Metal buildings, cars and trucks, machinery, gates, tanks, metal roofs, tractors, and farm equipment. Rust Converter works on any rusty iron or steel surface. Q: Can a Rust Converter be applied to a wood stove? A: No. It's not considered to be heat resistant. Q: Can a Rust Converter be applied to a non-rusty surface? A: No. Rust Converter should only be applied to the rusted areas, not the whole surface. After the Rust Converter has completely dry, it is recommended to wipe the surface with a damp cloth to remove all excess Rust Converter before you apply the oil-based paint. Rust Converter will glaze coat the non-rusted areas causing the paint not to adhere to those areas as well. Q: Can a Rust Converter be applied inside a tank? A: Yes, as long as it is treated as the primer only. You must paint over Rust Converter with a paint that is resistant to the contents in the tank. Q: Can a Rust Converter be used on Galvanized Steel? A: Yes, as long as there is rust on the metal surface. Galvanized (such as a boat trailer) is defined as a piece of metal that is coated with zinc to prevent corrosion. Q: How should you store a Rust Converter? A: You should store Rust Converter at room temperature out of direct sunlight. It should be protected from freezing (below 32 degrees F) or temperatures above 101 degrees F. Failure to follow storage instructions will cause this product to gel and become unusable. Q: What is the optimal temperature at which a Rust Converter should be applied? A: Rust Converter should be applied when the air and surface temperature is between 50 and 100 degrees F. Do not apply in direct sunlight or in very damp conditions. Q:What preparation is needed before a Rust Converter is applied? A: Remove large rust and scale particles with a wire brush or mallet. Then clean the surface thoroughly to remove dirt, dust and grease. Allow the surface to dry completely before applying Rust Converter. Q:What personal protective equipment is recommended when applying? A: Goggles and gloves are recommended because it may cause eye and skin irritation. It may also stain your skin. Also, if allowed to dry on your clothes it will stain. Q: Is a Rust Converter U.S.D.A. approved? A: No. Do not use Rust Converter where it will be in contact with foods or human water supply. You may use the Rust Converter inside a tank, but you must paint over it with a paint that is resistant to the contents in the tank. Q: How should a Rust Converter be applied? A: For the best results, brushing on is recommended. For larger areas, pour then spread with a broom, mop, paint roller or squeegee. You can also use a paint spray gun! Q: Can a sprayer be used to apply a Rust Converter? A: Yes. Airless sprayers tend to work the best, with less nozzle clogging. Rust Converter should not be diluted. Q: Are the vapors from a Rust Converter harmful? A: No. It is similar to latex paint. The majority of people are not bothered by the vapors, but as with most products of this nature, it is recommended to use it in a well ventilated area. Q: Is Rust Converter harmful if swallowed? A: Yes. Rust Converter contains chemicals. If swallowed, obtain medical attention. Q: How long does it take for a Rust Converter to dry? Q: Why is a high quality oil-based paint recommended for a top sealant? A: An oil-based paint is considered to be resistant to weather and rain. Q: How many coats of a Rust Converter should be applied on the rusty surface? A: To ensure complete transformation of rusty surfaces, always apply a second coat. Q: Do you have to paint over a Rust Converter? A: No. Although you do not have to paint after the Rust Converter application, if you would like a different color other then black then use an oil based paint which will also resist weather, sunlight, rain and even salt spray without peeling or cracking. Q: Do I need to apply a primer over a Rust Converter before I paint? A: No. Rust Converter is an excellent primer for use under all oil-based paints. Q: Can a primer be applied over a Rust Converter? A: Yes, but it is not necessary. The Primer must be oil based. Q: What do you clean the application equipment with? A: The application equipment should be cleaned immediately with soap and hot water. Q: How should a Rust Converter be disposed? A: You should not return the used Rust Converter to the original container. There may be a chance of contamination to the remaining Rust Converter in the container. Please dispose of in accordance with all federal, state and local regulations.